The newly refurbished Aboyne Tennis Centre serving up success according to committee members delighted by the number of tennis fans taking to its courts. The official opening last Saturday was the culmination of years of hard work and fundraising to rejuvenate its crumbling facilities. A major fundraising effort kicked off in 2015 with the aim of raising £25,000 towards the £170,000 project. Significant donations were received from Sport Scotland, Tennis Scotland, Landfill Trusts and local businesses, enabling the project to start in July 2017. Between July and October the courts were dug up and re-laid and high quality LED floodlighting was also installed on all courts, hugely increasing the amount of year-round tennis possible. 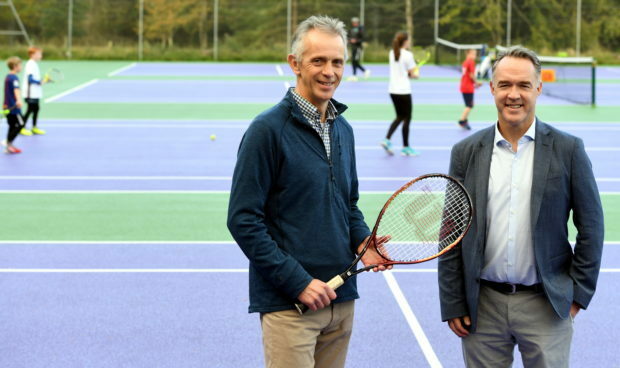 Scott Martin of Tennis Scotland was given the chance to see the completely refurbished courts, repainted in the purple and green colours of Wimbledon, and the newly-installed floodlights. He said: “I am delighted to see the results of the very hard work that has gone into the refurbishment of these courts and the great levels of enthusiasm and activity at the club. The club has welcomed a growing number of tennis fans in recent years, with a record five teams entered into this year’s North East Scotland tennis league and optimism that even more may be entered in 2019. Joss Marshall, a member of the Aboyne Tennis Centre committee, started playing tennis 20 years ago, at the same time her children picked a racquet up. She hopes that the new centre’s increased number of adult classes will mean older people are also inspired to take up the sport. “We’ve had so much more interest since opening the new courts,” she said. “It was wonderful to see the courts open after such a long period of planning and fundraising. A new website and online court booking system were also introduced by Aboyne Tennis Centre this week. Visit aboynetennis.net for more information.